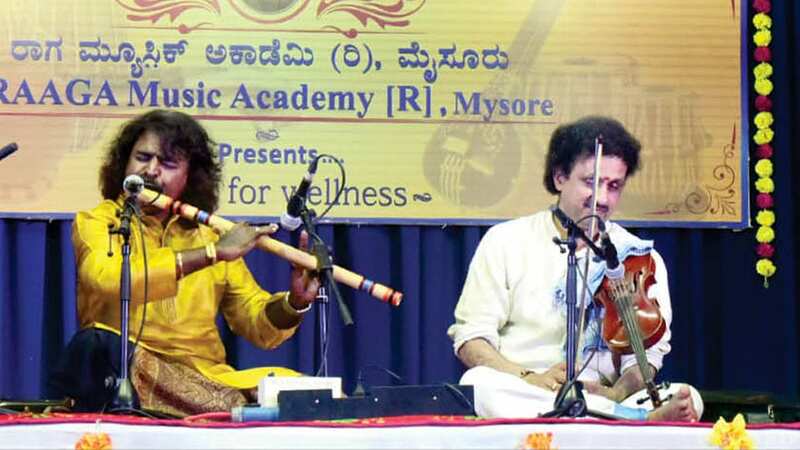 RAAGA Music Academy had organised a jugalbandi concert on its fourth anniversary on Aug.18. The artistes were Vid. Mysore M. Nagaraj (violin) and Pt. Pt. Pravin Godkhindi (Bansuri). Two most popular performing artistes today, the two enchanted the audience with their energetic performance. Both being masters of rhythm, and both being advocates of melody, the concert created a rich experience to the massive gathering. The two started the concert with Abhogi. While Pravin gave a melodic jhalak of the raga, Nagaraj played ‘Evvari Bodhana’ varna in a breath-taking speed. The clarity of swaras in his violin even in the unbelievable second speed took the audience by surprise. Pravin elaborated the Charana, after which Nagaraj resumed the varna. The duo chose Hamsanandi next. Pravin explained that Hamsanandi of the day would be a mixture of Sohini, Marva and Puria. Pt. Pravin Godkhindi (Bansuri) and Vid. Mysore M. Nagaraj (violin) presenting a jugalbandi at Sri Nadabrahma Sangeetha Sabha on JLB Road in city on Aug.18. They are accompanied by Vid. Arjun Kumar on mridanga and Pt. Rajendra Nakod on tabla. The raga was melodiously developed layer by layer by each, weaving a veritable tapestry of sounds combining different playing techniques together, creating a rich experience. Their spontaneity, perfect pitching and expressive rendering won them immense appreciation. The composition was a simple cluster of swaras composed elegantly for the day in Mishra Chapu by Nagaraj. Vid. Arjun Kumar on mridanga and Pt. Rajendra Nakod on tabla played with great clarity and weight. Abheri/ Bhimpalas was taken next. Their effortless ease in wandering from Mandra to Taara panchama, elaborating the delicate nuances of the raga with parallel swara-sangatis in all the three octaves creating a lovely design was sublime. The tana and the RTP showcased mutual respect and appreciation for each other. The Pallavi was again composed by Nagaraj in Adi tala. Violinist Dr. M. Manjunath (first row third from right), brother of Vid. Mysore M. Nagaraj, Musician Vidu. Koviladi R. Kala (third from left) among the audience. Keeping in mind the Independence Day month, the two presented ‘Vande Mataram’ in Desh, which filled the patriotic spirit in everyone present. Sindhubhairavi was also presented in all its grandeur. One of Sri Ganapathy Sachchi-dananda Swamiji’s earliest compositions ‘Pahi Pahi Gajanana’ from the album ‘Nama Sankeertana’ composed in praise of Lord Ganesha was presented with great co-ordination and devotion by the artistes and was received by the audience with joy.